She owns her role as Goodwill Ambassador. And we respect her for it. 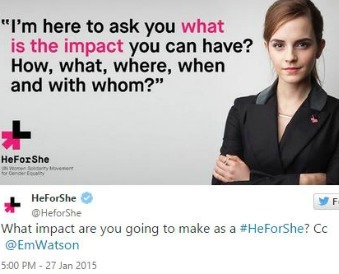 Emma Watson made a huge splash with her speech in September that launched the United Nation’s HeForShe campaign. A famous name at a high profile event making an inspiring speech… Yep. That’s pretty standard. But Watson has turned out to be the ambassador of a PR’s dreams. And what else would we expect from Hermione? Seems easy to say things people will cheer for? It is when you speak on an issue with conviction. And you know, based on the ease with which she tackled this Q&A that Watson is a feminist through and through. Certainly, she’s smart and articulate. But she also believes in what she’s an ambassador for. You didn’t hear about any gaffe’s or weirdly-worded responses from this Q&A because Watson spoke from the heart. It’s the number one rule for finding a spokesperson or “brand ambassador”: Find someone who believes in what you’re selling. A famous name will only go so far if trying to stay on message turns into ghastly jibber jabber. Watson covered the ELLE UK feminist issue last year, so she’s not playing around. Moreover, she’s a respected woman in Hollywood. She’s a great Goodwill Ambassador who owns her role because she truly wants to make a difference and get the message out there for all to hear.